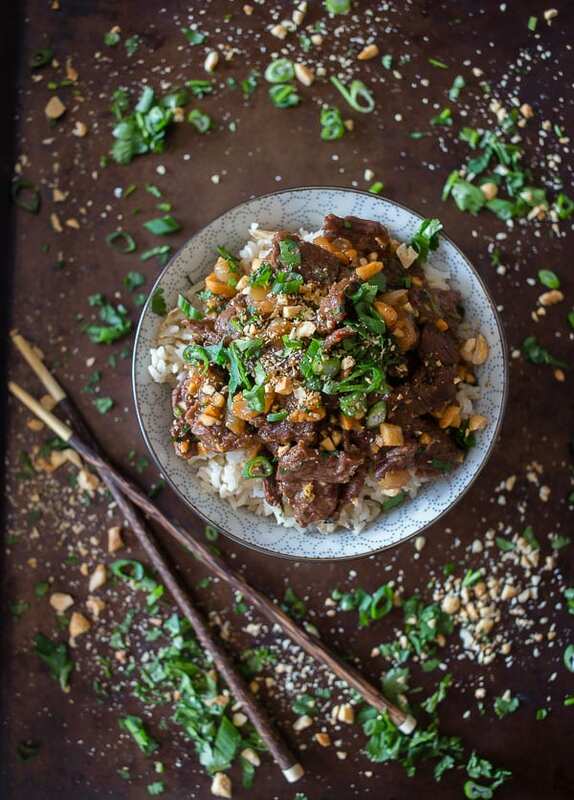 This spicy beef with peanuts is the perfect cold weather dish. 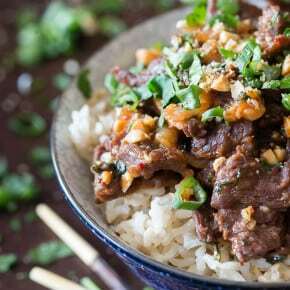 Perfectly spiced beef mixed with crunchy peanuts, cilantro and served over basmati rice. The best part is that it’s ready in just 25 minutes! As I type this I’m watching the Oscars. I’m not really sure why I even bother watching since I have seen zero of the movies nominated. But really it was this or watching old episodes of Man Men and 30 Rock. Well, now that I typed that out I’m thinking I should have went with Don Draper and Liz Lemon. But, now that I have been watching for over 2 hours I feel like I’m invested in seeing how it all turns out. Luckily I made a better decision earlier in the day to test out this dish. I wanted to make sure the spices and flavor were just right. Luckily for you the dish did not disappoint! I’m going on record to say this dish is a new favorite. Plus because it’s Asian inspired it gets me out of my “I never make Asian inspired food because it weirdly intimidates me” box. I know. It’s a totally weird intimidation but we all have our weaknesses. 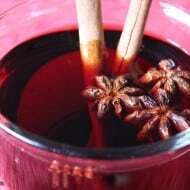 Around Christmas I was contacted by Della Rice to develop my very own “stir” for their #CreateAStir campaign. Wondering what stir means? It’s really just a fun word for a rice bowl creation. I of course answered yes because I’m a huge fan of rice (they sent me 5 different bags!) and love me a tasty meat topped rice bowl. The thing I probably love best about this dish is that it’s ready in just 25 minutes. I would say you could make this in 20 minutes but you need just a few minutes for measuring and stirring. If only our kitchens came fully prepped like on some fancy cooking show. The other thing I love about this dish is that it’s packed full of flavor. I even used my cooking nemesis – fish sauce. I don’t use a lot of fish sauce because if I’m being honest I cannot stand the smell. 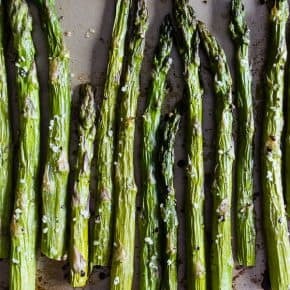 How can something that smells so gross make food taste so good? If you have never made yourself a rice bowl you need to change that asap. Think of your rice like a blank canvas and top it with whatever floats your boat. I went spicy because it’s what I love and I went Asian because I wanted to give those flavors a whirl. Plus it’s fun to get into the kitchen and get creative. 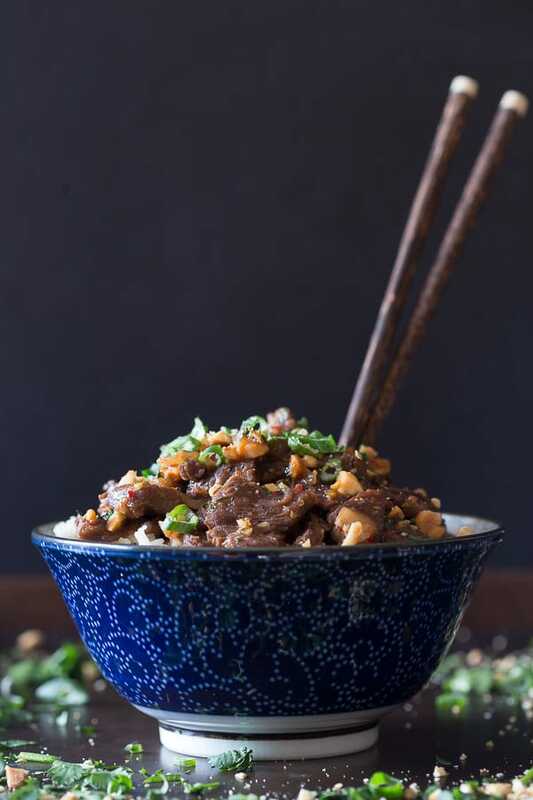 This spicy beef with peanuts is the perfect cold weather dish. 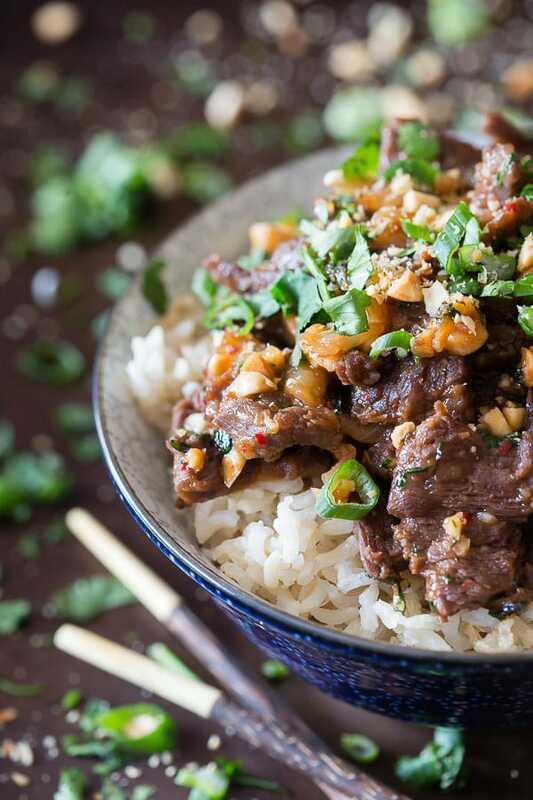 Perfectly spiced beef mixed with crunchy peanuts, cilantro and served over basmati rice. The best part is that it's ready in just 25 minutes! In a sauce pot add rice and water. Bring to a boil, reduce heat to low and cover. Cook for about 20 minutes or until all the water has been soaked up and the rice is fully cooked. While the rice is cooking start working on your meat. 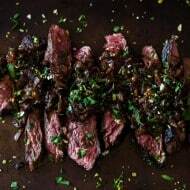 In a large bowl add sliced beef, low sodium soy sauce, dark brown sugar, fish sauce, grated ginger, chile paste and lime juice. Stir to combine and set aside. In a large skillet set over medium heat add olive oil. Once the oil is hot add in the onions and saute until soft and translucent. Turn the heat to medium high and add in the meat and any marinade from the bowl. Saute quickly until the meat is browned and the sauce is cooked down and thick. Stir in peanuts and cilantro and remove from heat. To serve, top cooked rice with meat and sprinkle with addition chopped peanuts and cilantro if desired. Della rice is also giving away 50 rice cookers! Enter below and good luck! Stay in touch with Della Rice! Disclosure: I received financial compensation from Della Rice for creating this stir. All opinions are 100% my own. I haven’t seen any of the movies…well except for Baymax..cause you know…kids! I always have to remind myself to not smell the fish sauce when I open the bottle when using it in a recipe. But the smell still invades the kitchen. I’d like to meet someone who likes that smell.. yuckk!! This looks fantastic. I’m seriously drooling over here. I started watching the Oscars, but also haven’t seen any of the movies so yeah, what’s the point. Also, gotta save up my TV time for The Bachelor tonight! Yeah!!!!!! I agree, fish sauce does stink! How can something that smells so bad add so much flavor? This dish looks beautiful….worth adding the fish sauce for! I’m in that same Asian food box but you’re making me want to climb out because this looks awesome! Pinned. This looks like the perfect dinner to me! I love that it is done in about 25 minutes! 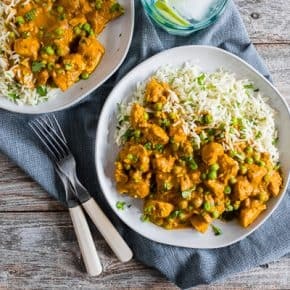 I love this dinner – the recipe looks great! This looks great! I love Fish Sauce and pretty much all Asian ingredients! This will make a great weeknight meal. I can’t stop staring at this gorgeous dinner! 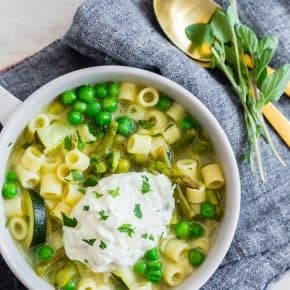 Positively stunning recipe and the flavors… totally putting this one on the menu and pinning now! This was the first year where I’ve actually seen one of the movies! Only because it was on HBO all ready! some of those movies looked weird, like birdman… but it won on these awards. American Sniper is sooo worth seeing plus Bradley Cooper is not bad to look at. 🙂 Never is this dish, holy hannah I want this in my belly now! Seriously, the Oscars were SUCH a snoozefest, and I had even seen 7/8 Best Picture noms. Just, sooooo sooooo boring and sooooo long! I wish I would have watched old Mad Mens, too. Don Draper never disappoints! 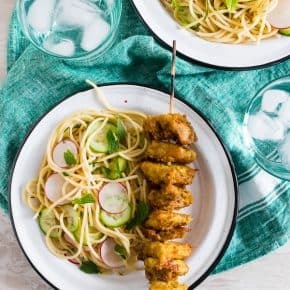 This dish has me drooling, and I can’t believe it’s ready in just 25 minutes. Gives me a reason to break out my neglected fish sauce, too. Pinned! I love, love rice bowls, and have totally been craving something spicy – this is going on my list!! My hubby and kids love all things Asian inspired and I too rarely make many dishes like this. The photos are stunningly gorgeous! I love that this can be made so quickly! It looks delicious! Haha! Love the fish sauce (but I’m with ya on the smell)! This looks so delicious and how great that it’s easy to put together? Love your photos! Drop dead gorgeous dish! Can’t wait to try it! I’m so glad you made this Asian dish and even used fish sauce. It’s good to get out of your comfort zone. . plus, dude, this is freaking beautiful. Look at you cooking Asian food like a pro. I hope for more people to not be weirded out by different ethnic foods and to experiment more in the kitchen. . but I grew up in a Korean household (we had an American nanny, who only made us kraft mac and cheese and heated tv dinners) and then we dined like kings when my mom and dad made Korean food. . and my dad has always been in the restaurant business. . he’s had like 7-8 different kinds of Asian food restaurants (Japanese, Korean, Korean BBQ, sushi etc) while I was growing up. . so I’ve always been surrounded by food and my dad always encouraged us to try new foods .. yeah fish sauce stanks but you’re right. makes a big difference in taste. anyway, I love this and hope to see more Asian inspired recipes from you! You had me at 25 minutes! What a great looking rice/beef bowl, it’s amazing it comes together so quickly. I feel the same way about fish sauce but it brings so much flavor. 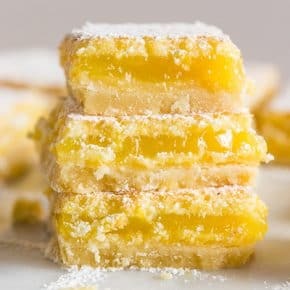 Pinning this yumy recipe! Every year, I want to see all the Oscar nominees so I can be informed. And it NEVER happens. Though we did see Birdman, Whiplash and Foxcatcher. I’d totally recommend the last two! 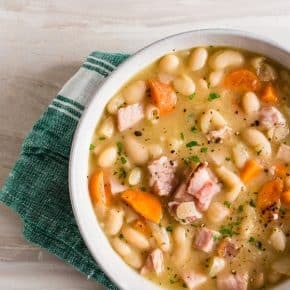 Eat them with a big bowl of this for comfort, you’ll need it. Absolutely never smell the fish sauce! I’ve got my chopsticks ready and I want to dive into this bowl. Pinned. I saw 25 minutes and I was SOLD! Rice bowls are the best especially when they’re covered in this delicious beef & sauce! I invested more than enough time in the Oscars and man was I BORED. Except when I opened up my web browser this morning to see how well Lady Gaga had done and almost cried tears of joy listening to her sing Sound of Music. I want to invest more time, and my feelings into this bowl. Man, oh man! I know the fish sauce stinks, but it’s so important in so many Asian sauces and dishes…like this! Wow, I just ate dinner and would take a bowl now. Love it! I make homemade curry paste but am terrified of roast chicken lol. We all have our weird food intimidations! And yay for the fish sauce! This looks great! If all my asian inspired dishes looked this way when I stepped out of the box, I would be making these all the time! And fun rice bowls? All about em! This is going straight to the top of my must-make list. Love the combination of flavors! I love everything about this! I want a bowl! While I have never made a rice bowl we did buy a rice cooker that allows us to cook rice easily and more often! Definitely need to go make a rice bowl now! I made this last night. It was freakin’ awesome. Thanks! Wow does this look amazing. I want a big bowl of it right now! I honestly only watched part of the oscars to see those dresses. I have no idea about the movies they nominate, and when I’ve tried to watch them in past years, I was bored to tears. hahaha I love your comment about fish sauce. it so true…that stuff smells flat out WEIRD. But it’s soooo delicious. I love this rice bowl! And the dish itself looks amazing! I totally agree about fish sauce but I feel like it’s what makes Asian food Asian food. You know what I mean? Sure you’ve got the other awesome flavors but it’s the one that makes you go hmmm. . . Also pass the chopsticks please. Dear Lord in Heaven these photos are mouthwatering! So much so that for my 2nd Stir I made something along the lines of this but now have to go back to the drawing board due to your incredible shots! I love these flavors! You hit this one out-of-the-park! Oh and why do I watch the Oscars?? For my boyfriend Jared Leto who has now popped up on them 2 years in a row…woot! And yes…its time for him to shave! I’m kind of surprised to hear that your a little intimidated by Asian foods…especially when you can turn out a dish that looks like this! WOWZA! I love to cook Asian food and am always looking for new ideas. I’ll have to look out for Della Rice at the store! So as I was reading this, I couldn’t remember if I’ve ever used fish sauce or not, but I’m sure I would have smelled it and surely I would remember that! 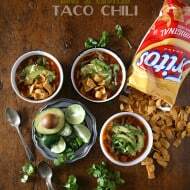 I need to try this soon, it looks right up my alley! I dont make Asian cuisine enough! I need to try this dish! You always make everything look amazing! This is absolutely gorgeous! My little guy loves peanuts so I know this would be a huge hit in our home! Wow! This looks amazing! Your photos are beautiful! Pinning.